The 2018 Dakar Rally began in Peru, with the first stage from Lima to Pisco taking the competitors straight into the sand dunes making for a challenging beginning. 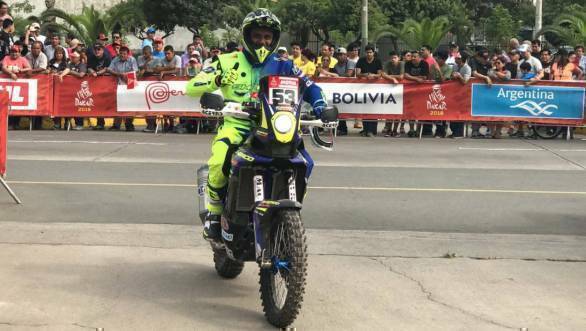 CS Santosh on his way to the podium for the flag off of Dakar 2018. However, there was plenty to cheer for as far as the Indian contingent at the Dakar goes. 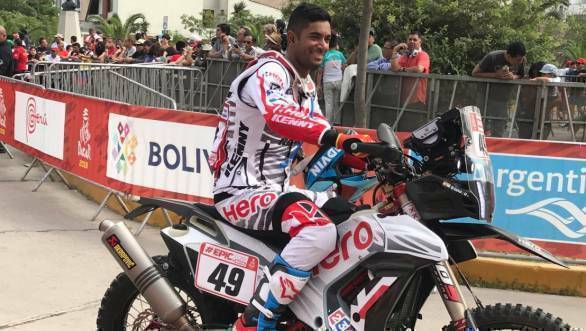 CS Santosh, astride the Hero MotoSports Team Rally's RR450 finished Stage 1 of the rally 13th overall in the motorcycle category. Also getting off to a strong start was Oriol Mena, the team's rookie rider, who finished 23rd overall in the motorcycle category. Solid start for the day for KP Aravind too. There was disappointment too for the team, with their Portuguese rider, Joaquim 'JRod' Rodrigues' Dakar already coming to a close on Stage 1. A crash in the dunes meant that JRod had to be airlifted to a hospital, where medical tests were run on him. The good news is that other than a broken wrist, which has put him out of contention, he's otherwise uninjured. Over at the Sherco TVS camp, KP Aravind is ranked 30th after Day 1. Adrien Metge ended the day in 24th position, while Joan Pedrero Garcia finished 25th.